Description: Doto pinnatifida is one of the largest species of the genus Doto, large individuals reaching 30mm in length. It is characterised by black tipped tubercles on the sides of the body and on the cerata. Occasionally there are a few of these tubercles on the dorsum. The rhinophore sheaths have a series of black spots around the edges. 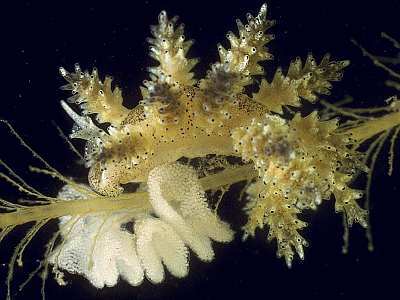 Habitat: The sole prey of this animal is the hydroid Nemertesia antennina. 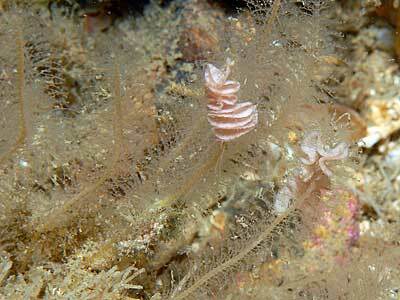 The spawn is a long pleated ribbon, laid on the stem of the hydroid. Distribution: Widespread and common in the British Isles. The species' range extends as far north as Scandinavia and south to northern Spain. Similar Species: The only other Doto species with tubercles on the body is Doto tuberculata, a smaller animal with tubercles arranged in irregular rows across the back, between the cerata. Black-tipped tubercles on the sides of the body. Black spots on the edge of the rhinophore sheaths. Picton, B.E. & Morrow, C.C. (2016). Doto pinnatifida (Montagu, 1804). [In] Encyclopedia of Marine Life of Britain and Ireland.